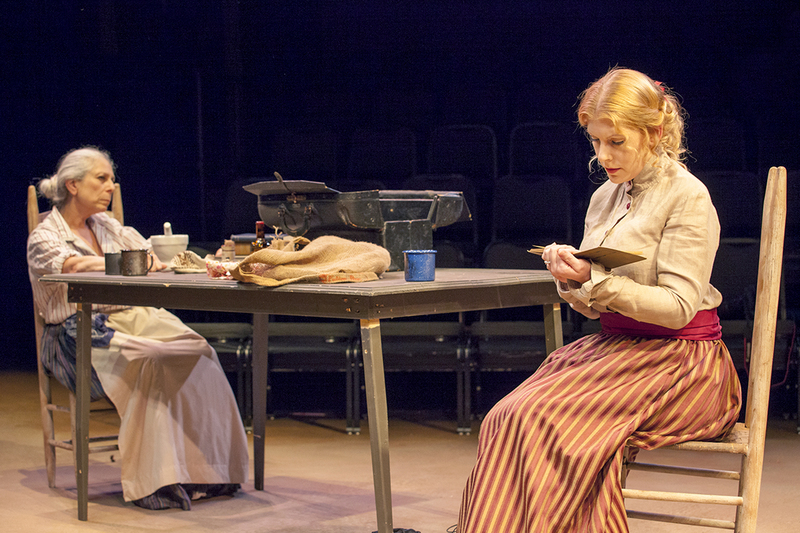 Mustard Seed Theatre opens their season with a production that is brilliant in every respect. “Going To See The Elephant” offers a deceptively clever script, strong direction and one of the best ensemble casts we’ve seen in some time. The technical crew adds to the “aura of greatness” that best describes this overwhelming performance. To give you an idea, the curtain call came as a surprise to the opening night audience. 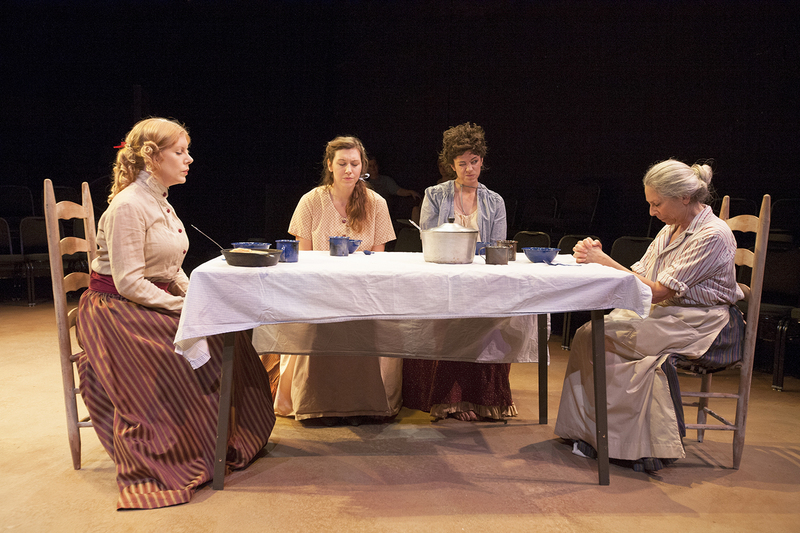 Granted, it was a somewhat abrupt ending but it really did make you wish for more time with these four delightful ladies from the 1870 Kansas prairie who must cope with fear, isolation, natural and real enemies and…each other. So when one character leaves for good and another turns to realize that things may not change for her, it’s makes you want to see what’s going to happen next for her and the other two remaining women. So the lights dim and go out, the actors come back on stage and the audience is silent. Suddenly, applause erupts and a standing ovation ensues. We’ve suddenly realized we’ve witnessed a very special evening in the theatre. 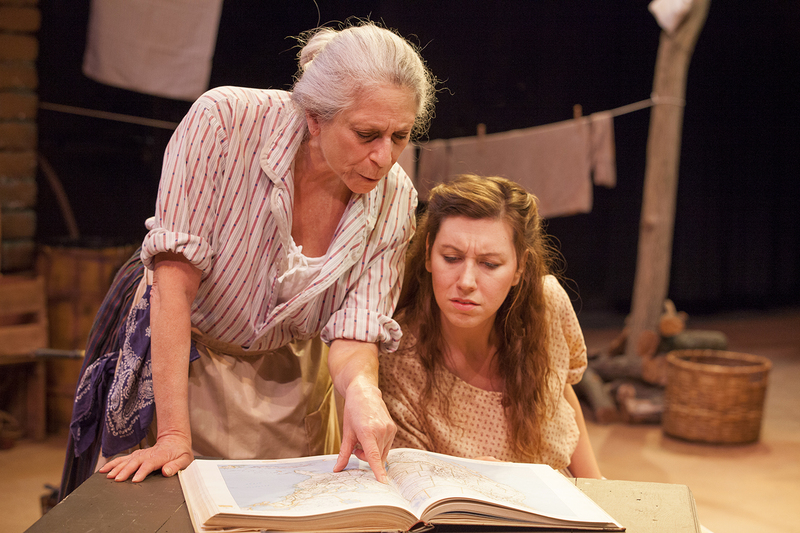 Nancy Lewis as Maw points out destinations she’s bound for to Emily Baker as Sarah in “Going To See The Elephant” at Mustard Seed Theatre. Nancy Lewis leads the way with a repeat of her Kevin Kline winning performance as Maw. She feels the need for change as this is what she’s known all her life and what she feels keeps her alive. So when she reveals her plans to move even further west to become a nurse in Colorado, Sarah, pregnant with her fourth child, panics. How will she manage? Emily Baker gives a touching and powerful performance as Sarah. She sings because she is full of life but also to keep her wits about her. Two “house guests” at the homestead include an offstage Mr. Nichols and his wife, Helene. Although we never see the mister, Helene, given another strong performance by Suki Peters, is a disruptive force in the lives of the other three women. She and Maw battle for supremacy while she and Sarah reach a common ground talking about the sons they’ve lost to illness in this desolate country. This is one of many touching scenes that stretch the acting chops of these women and they succeed admirably. From stances to facial expressions, from delivery of lines to true emotion, from flat out powerful acting to nuanced magical moments, these four ladies are fantastic. Rounding out this quartet is a neighbor, Etta, given a remarkable performance by Jessica Haley. Quite shy and backward, she is fanciful and naive. Her story adds to the diversity and strength of both the characters created by playwrights Karen Hensel and Elana Kent and to the actresses who mesmerize us for two-plus hours. “Going To See The Elephant” is one of the most surprising productions to pop up on local stages in some time. The stars have aligned perfectly as director Deanna Jent has put her magic to work to bring the most out of this wonderful script and these four remarkable actresses. Daniel Lanier’s set design is exquisite in its desolation and the Michael Sullivan lighting design adds to the beauty while Jane Sullivan’s costumes hit the mark as well. With the theme of conquering the land and moving on to see what’s on the other side or, as Maw puts it, “going to see the elephant,” these ladies meet at a crossroads in their lives and somehow help each other conquer those fears and feelings of isolation while “moving on” in their own particular ways. This entry was posted on September 3, 2012 at 9:43 am09 and is filed under Uncategorized. You can follow any responses to this entry through the RSS 2.0 feed. You can leave a response, or trackback from your own site.